The Red Rocks are back. Utah’s gymnastics team gives fans a sneak preview Friday night at the Huntsman Center. (Leah Hogsten | The Salt Lake Tribune) Head coach Megan Marsden tells the girls to "stick" their landings on the beam during a huddle as the No. 4 Utah gymnasts host No. 20 Georgia in the final regular season meet at Jon M Huntsman Center in Salt Lake City Friday, March 16, 2018. 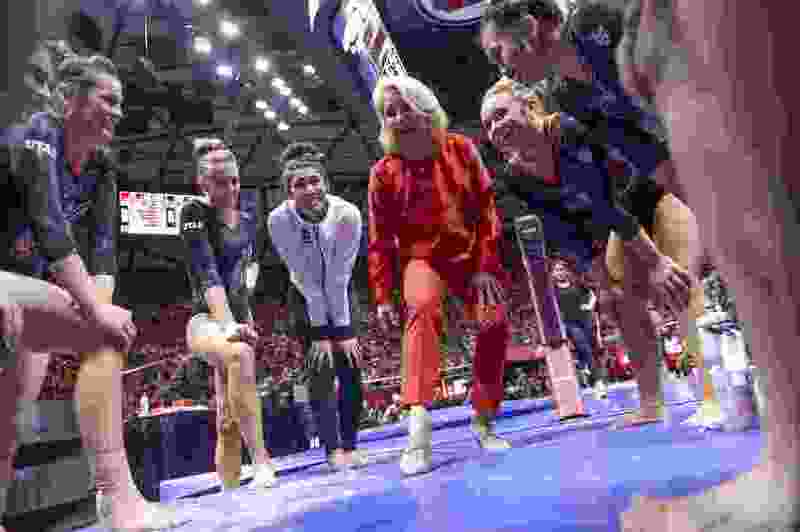 Whenever she is out in public, Utah gymnastics coach Megan Marsden frequently fields questions about how good her team is going to be, who looks good in practice, etc. Fans will have a chance to answer some of the questions they have about the team and feed a bit of that gymnastics hunger on Friday when the Utes unveil their 2019 squad at the Red Rocks preview at the Huntsman Center. Parking and admission to the event, which begins at 7 p.m., are free. It will be broadcast live on the Pac-12 Networks and ESPN 700 radio. The first half of the intra-squad meet will feature the whole team on vault and bars. The Utes will split into two teams for the balance beam and floor. The event will give Utah fans their first look at freshmen Hunter Dula, Cristal Isa and Adrienne Randall. A fourth freshman, Cammy Hall, suffered a torn Achilles tendon in the preseason and won’t compete this year. She was expected to contribute on the vault and floor. Even with the loss of Hall, the Utes expect to have a national title contender squad as they return 20 of 24 routines from last year’s fifth-place team. Two-time NCAA champion MyKayla Skinner leads the group which also includes All-Americans in Kari Lee, MaKenna Merrell-Giles, Missy Reinstadtler and Sydney Soloski. The Utes open their season Jan. 5 against Penn State, then travel to BYU the next week and open the Pac-12 schedule at Oregon State Jan. 19. Marsden said the Utes have had a strong preseason, with Skinner working a new release on the uneven bars, Lee looking extremely strong and Merrell-Giles improving on all events. Reinstadtler has been impressive too, but has a sprained ankle that will limit her in the Red Rocks preview.